8 Mar 2012: The modified circuit diagram for the dual system is enclosed. One single pipe will go up to the loft, and up there, it will divide into two directions - controlled by a couple of 2-port valves. The existing pipes will be used. It is odd how the progress of human affairs often moves from complicated ideas that get refined to effective simplicity. The revised circuit diagram is caused mainly by the failure of the Danfoss, but this has turned out to be a piece of luck as the resulting diagram is simpler and will be cheaper to plumb in - no nightmares of pipes coming through the floor, less risk of system losses, easier for maintenance, and easier to replicate elsewhere. Two solenoid valves will still be needed, but they are cheaper and more easily replaceable in the future event of a component failure. I have realised that the system will work more efficiently when I return to the 'Trickle while we Work' mode of plumbing. After the heat pump has done a cycle, it continues to move liquid round the circuit to clear what is in it and send to the ground, but it is sending cold glycol! With the Trickle mode, it would recover back to a normal circulating temperature more quickly. Postscript: One of my colleagues in the University, Dr Chong, has pointed out that when both the Surya and the Varisols are running there will be a short circuit between the two, and I need a non return valve in the Varisol circuit to prevent this. This is because when they are both working, the Surya pump will work at 5 litres/min and the Varisol pump at about 1 litre/min. So instead of pumping around the ground loop, the liquid will take the line of least resistance, flowing back through the Varisol pump. So the above diagram has been amended to show one. As the drawing looks more like a London Underground map, I also followed his suggestion to make the junction in the loft look more like a Manifold, and to consider reorganising the plumbing likewise. I would make some DHW with those tubes and after what is left I would dump to bore hole. Just one extra heat exchanger and small circulation pump for your GSHP. Hi Sami, I have a solar engineering plumber coming round to make a reconnaissance. On this occasion, I want the job done quickly, and with fewer stressful moments than in my earlier efforts.) You are right, this would be a big help, and it could be in the large space in the linen cupboard above the GSHP. My worry has been..... the need for yet more pipes through the first floor, and the need for using yet more copper.. however, a small 90 litre tank would be a good idea. We only use about 50L per day, so a preheater tank of that size would be good enough. 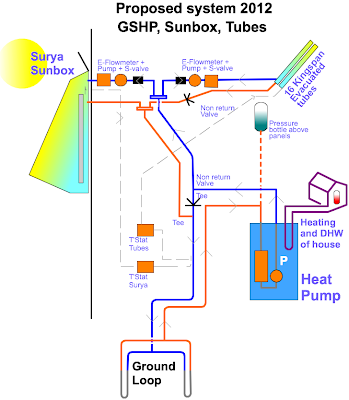 One problem with Sami's proposal is that in the mornings, when the tube circuit hasn't got up to temperature, it would start up (because the Delta-T is between collector temperature and lower ground loop), and the morning process would be draining remaining heat OUT of the tank into the ground. But I don't have a problem with that, as it would quickly warm up again later in the day. We also need a v small tank (e.g. 80-90 litres) to stop having a large body of standing water at tepid temperature for too long, in which there would be legionnaires risk. I would use your GSHP-tank with those tubes. No need for extra tank. Just little circulation loop between your UFH output and input. To that circulation you need heat exchanger and small circulation pump. You need also 3-way valve or magnet valves to operate. 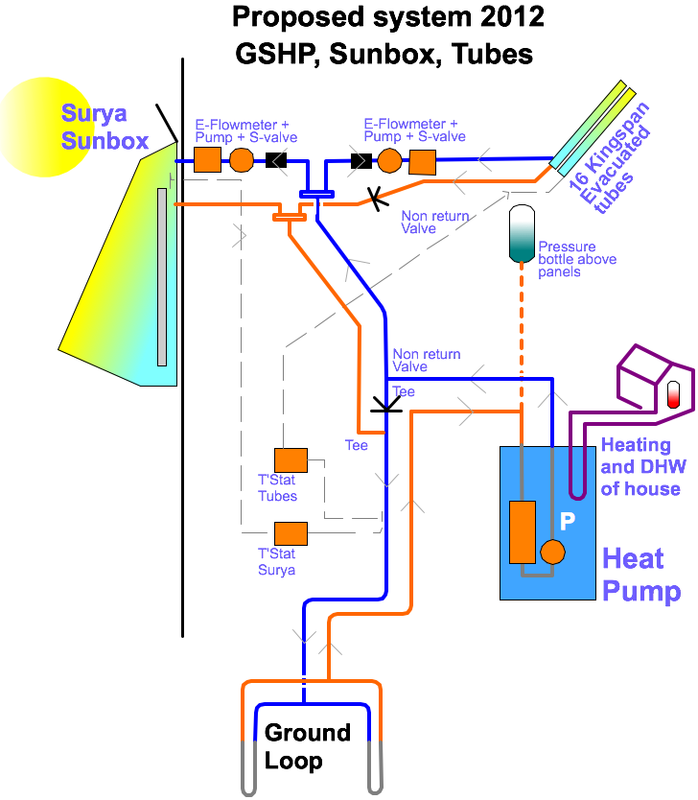 If that is too complicated, you could make little more simple system by adding heat exchanger to your DHW input, where it is going to your GSHP. Whenever you use hot water, it will go thru that heat exchanger. As there is a little use of DHW at night time, it will work all time when there is a sun shining and your tubes are working. Which I wasnt aware of before. the price of DHW cylinders is exorbitant! must be all that copper. We use very little hot water, and the heat pump maintains the DHW at a constant 51degs, using thermal energy from the ground store. Looking at the readout from the GSHP, the effort (annually computed) in doing the DHW is less than 25% of the workload of the machine. Hi Sami, thanks for the references. It is astonishing that it seems to easy to get one of those heat exchangers i Germany, but not in the UK. I guess the water tank or exchanger will have to wait, but i will try to reconfigure the plumbing so that there is a chance to fit one. Maybe instal a manifold.